VIKINGS RULE AT NSW LONG COURSE CHAMPIONSHIPS! The NSW LC Championships 2011 were held at SOPAC, Sydney on 9/10 April 2011. 4 of the team swam the 200m Butterfly – Brenda Day, Pam Munday, Ann Reid and David Bale – WOW! Pam Munday had a great weekend – four 1st places and one second, coming 2nd in her age group individual points score. Brenda Day put in her usual ironwoman performance – three 200m swims, one 100m and two relays. Ann Reid – another ironwoman performance, including a great Freestyle anchor leg for the women’s 160+ medley team. Atsuko McGowan – had a good weekend, total 8 swims with two 1st places, a 2nd and two thirds (including a nice 200m IM in 3:05.32s), coming 3rd in her age group. Caroline Makin – total 8 solid swims including a fast 50m Backstroke PB in 39.89 and a good 45.26 50m Breaststroke for 2nd place. Kristen Leydon – newcomer to State championships put in seven good swims including a nice 50m Backstroke in 46.19. Anne Smyth – although having to leave early on Sunday morning, Anne still managed to put in six swims including a 2:43.00 for 200m Freestyle for two 1sts, a 2nd and two 3rds, coming 3rd in her age group. Cecelia Kaye – seven good swims including 1st place in her 50m Breaststroke in 48.73. Kristy Messenger – another newcomer to State championships put in seven good swims including 2nd place in her 200m Freestyle in 2:52.49. Jill Blomeley – seven good swims including a nice 200m Breaststroke in 3:38.68s for 3rd place. Annette Britten – seven good swims including a good 50m Butterfly in 39.11 and 200 IM in 3:20.56. Tania Arnold – seven quality swims for a 1st place, a 2nd and two 3rd places – pretty tough 35-39 age group when 40.12 and 1:28 for 50m and 100m Breaststroke respectively gets you two 3rd places. Jeff Day – whose entry enabled three additional relays – had five good swims including 34.96 for 50m Freestyle. Luke McGowan – eight really good swims including 50m Backstroke in 37.97 resulting in one 1st place, two seconds and one 3rd…. Luke – work on your Butterfly and you’ll be able to put a really good medley together! David Bale – five solid individual swims, with a PB for the 200m and 100m Butterfly events and 2nd place in both, and three relay swims including a good lead-off backstroke(!) for the men’s 4x50m medley relay. Ian Hampton – a hard weekend “at the office”, although a 50m Butterfly in 38.65 put a smile on his face, 3rd in age group. We entered 10 relay teams in the 6 relay events – for two 1st places, one 2nd, four 3rd places, two 4th places and one 5th. The best was last – the women’s 160+ 4x50m medley team (Kristen Leydon, Caroline Makin, Annette Britten and Ann Reid) won in emphatic style – with great last leg by Ann Reid. The 160+ women’s team also have bragging rights over the 120+ team from the 4x50m Freestyle relay!!!! In the total Club points competition, Tuggeranong came 5th overall behind Seaside Pirates, Warringah, Manly and Blacktown City. 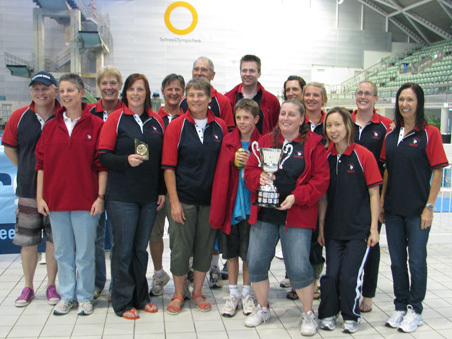 We won Division 2 with 759 points, and came second overall in the trophy for average points/swimmer behind Blacktown.